Often when you add an indexer / array property you need to insert additional members that implement the indexer. For example a field to store the values, make sure there’s a constructor and add some initialization code. 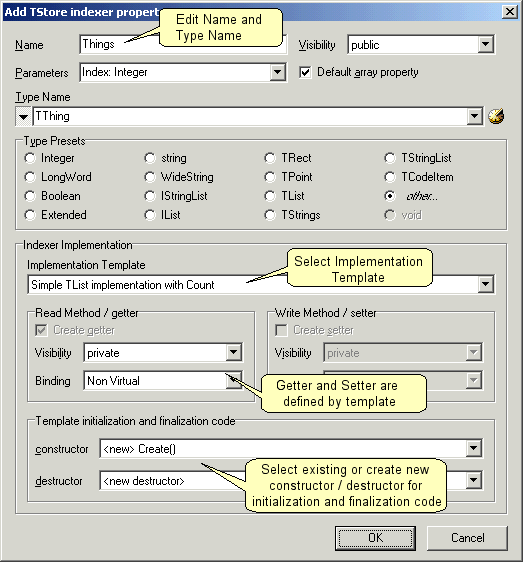 The ModelMaker Code Explorer Add Indexer Wizard is used to centralize this process. The wizard is highly customizable using Indexer implementation templates. Assume you have a class TStore that stores TThings. Apart from the property declaration there are usually other members required to fully implement this indexer property. For example: you’ll need a field of type TList or TObjectList to actually store the things. This field must be initialized in the constructor and Freed in the destructor. You additionally might want to expose a Count property to allow iteration. The above scenario is very common and ModelMaker Code Explorer comes with a highly specialized and flexible “Add Indexer” wizard that automates (most of) the entire process. The indexer implementation templates are customizable and new ones can be added. Referring to the above example: More advanced implementations could include methods FindThing(..), AddThing(..), DeleteThing(..) etc. Indexer Templates are stored in directory [install-root]\Shared\Indexers. Typically “C:\Program Files\ModelMakerTools\Shared\Indexers”. //MM#:type=indexer-implementation //MM#:description=Simple TList implementation with Count //MM#:getter=begin\N Result := <!PropertyType!>(F<!PropertyName!>[<!PropIndexCallParams!>]);\Nend; //MM#:ctor=F<!PropertyName!> := TList.Create; //MM#:dtor=FreeAndNil(F<!PropertyName!>); unit IndexerTemplate1;interface type TCodeTemplate = class private F<!PropertyName!>: TList; function GetCount: Integer; public property Count: Integer read GetCount; end; implementation function TCodeTemplate.GetCount: Integer; begin Result := F<!PropertyName!>.Count; end; end.